Wednesday, January 23, 2019 – Van Andel Arena, Grand Rapids, MI. 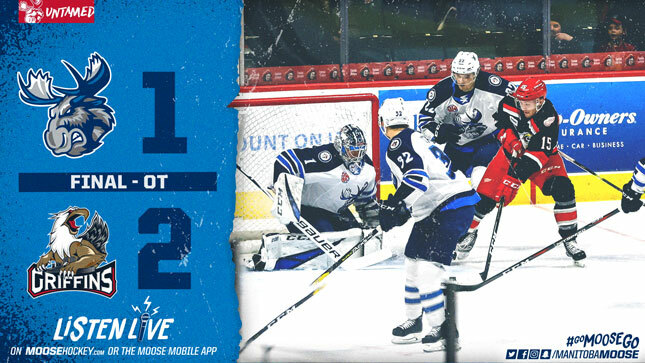 The Manitoba Moose (19-18-3-1) fell 2-1 in overtime to the Grand Rapids Griffins (24-13-3-4) on Wednesday night at Van Andel Arena. Manitoba took a penalty just 21 seconds after puck drop leading to some early pressure by the Griffins. Reigning CCM/AHL Player of the Week Eric Comrie stood tall for his club, stopping all eight shots he faced in the opening period. The momentum seemed to turn near the midway point of the frame, when subsequent penalties opened the ice with four-on-four play. The Moose kept pressing, drawing a delay of game penalty by the Griffins with 2:41 left in the frame. Seth Griffith found Logan Shaw on the back door, and he started the scoring with just over one minute to go in the period. The Moose got into penalty trouble in the second, playing shorthanded four times in that frame alone. At the 10:47 mark of the period, while playing at even strength, Grand Rapids finally solved Eric Comrie when Wade Megan whistled a one-timer in from the slot off the rush. Despite being down a man for much of the period, Manitoba still had their chances, getting 12 shots on Harri Sateri including a shorthanded breakaway from Marko Dano. In the third period, the game took on a cautious nature. The best chance came to Griffith, who found a loose puck near the face-off dot with plenty of traffic out front. Griffith got a shot off, but Sateri made the stop. In overtime, both teams had breakaway chances, but the goalies responded. First it was Comrie, facing down Matt Puempel and keeping the game going. The Moose responded twice, with both Griffith and Cameron Schilling cutting in alone, but neither could finish off the Griffins. For the second straight time in Grand Rapids, Carter Camper scored the OT winner, this time at 3:37 of the extra frame when he picked the top corner with a wrist shot. Comrie was named the game’s third start after making 34 stops. Logan Shaw scored his fourth goal in five games, three of the goals came on the power play. Eric Comrie has faced more than 30 shots in his last 11 starts (7-2-2). 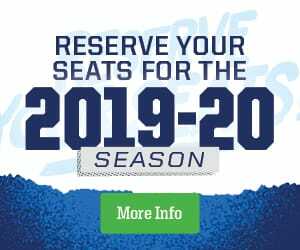 The Moose continue their three game road trip on Friday against the Rockford IceHogs (7 p.m. CT), before wrapping up on Saturday afternoon in Milwaukee (1 p.m. CT). For all coverage while the team is away, head to moosehockey.com.